Do the Penguins have a goaltender problem or a back-up goaltender problem? I think they have a back-up goalie issue but was shocked to see some Pens' fans fantasize about picking up Ryan Miller. The St. Louis Blues have elected to let Ryan Miller go to free-agency. The Blues acquired Miller and Steve Ott in late February from the Buffalo Sabres for Jaroslav Halak, Chris Stewart, prospect William Carrier, a first-round draft pick in 2015 and a third-round pick in 2016. (USA) Turns out he was a rental. Miller has long made it clear long made it clear that he’d welcome a move to Southern California to make life easier for his wife, actress Noureen DeWulf. Do any of the California teams need him? Should the Penguins explore a deal with Miller? How would a Miller/Fleury pairing even look? 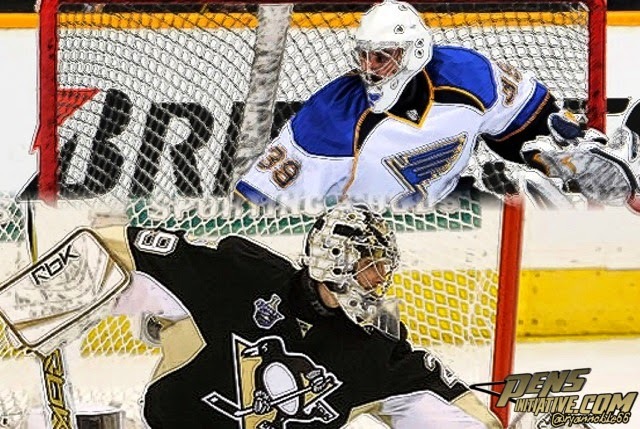 Wait....No one is suggesting the Penguins give up Fleury….right? What BETTER goalie is available? Who would make you say, "Let him go"? Many of you step up with much bravado to call for coaches to be fired and major players to be traded but if you’re getting rid of Marc Andre Fleury shouldn't it be for someone clearly better for the job? Who is even available? Tim Thomas can still play but he isn't a starter. Al Montoya is available….and I’m moving on. Chad Johnson has posted a .926 save percentage this year with the Boston Bruins. Jonas Hiller's last three seasons haven't exactly been elite but he's a FA. Jeff Zatkoff did a commendable job but isn't a starter. Vokoun has his health to consider. There are a handful of others but arguably none better than Fleury. Ryan Miller has been a good goaltender. Miller was, at times, the lone bright spot on a dismal Sabre’s squad. He is an Olympic Silver Medal goalie. He started strong with the Blues but became inconsistent and unreliable. He couldn't get the job done, going 2-4 with a 2.70 GAA and a brutal .897 save percentage in a first-round loss to the Chicago Blackhawks. Is Miller who you’d replace MAF with? I have Faith in Fleury! I also like & admire Ryan Miller. Loved watching & cheering for him in the 2010 Winter Olympics with Team USA, but I doubt that Miller would want to be Flower's back-up goalie. That would be very Interesting! Interesting, yes, but in reality also too expensive considering this tight Salary Cap year. Love our Pens & always look forward to each new Season, each new game, each new Playoffs with anticipation & Hope. Let's Go Pens!!! Marc-Andre Fleury is the Penguins goaltender! That is the way it should stay! He served the Penguins well throughout the season and in the playoffs with a couple bobbles here and there. There is no replacing him at this point. I would love to see his stay!